I finally got a good shot of Little Bit. She is about the size of a pigeon. Sue has decided to go broody. She was setting eggs when we got her from Bageniece Farms. Most of the hens we have are from breeds that don’t tend to go broody, and I’m hopeful that she’ll turn out to be a good momma hen. 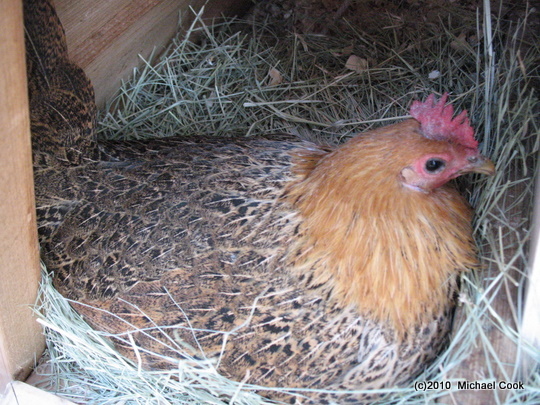 Of course, without a rooster, she’s not sitting on eggs that will hatch – so I ordered some fertile eggs through Ebay. I love the way she fluffs up her ruff. What you can’t see, is that she’s pecking my hand! She hasn’t hurt me at all, but she’s made it clear that failure to obey the warning peck will result in a more aggressive one. Looking at pictures and reading, I think Sue may be (at least partly) a breed called Golden Phoenix. She has the right shape and coloring, they’re a breed that tends toward broodiness, and they tend to roost high up. The first couple of weeks, we kept having to fetch her out of the honeysuckle on the fence and tuck her into the hen house! My hen Little Comb went broody. What they suffer through to hatch those eggs is amazing and heartbreaking. I had to take her out of her broody box twice a day to make sure she ate, drank, and took a poop. She could barely move her legs they were so stiff. And she plucked out all of her under feathers. All the color went out of her comb and waddles as she gave everything for those eggs. She never pecked me when I handled her, but I raised her from a chick. She was a great mom, too. Good luck to your girl! What a little beauty! I hope all goes well with her eggs. Anybody recognize this hem? 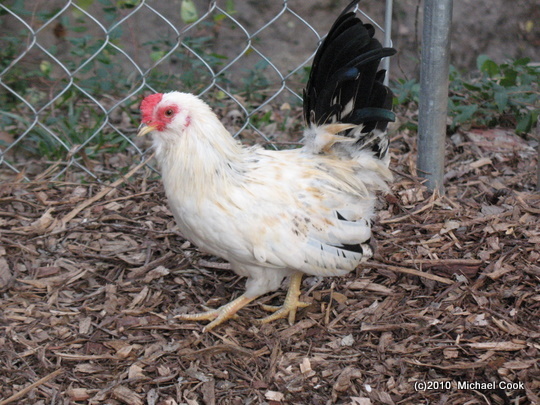 Our Little Bantam… hen?